Cut watermelon into 1-inch thick slabs and lightly brush with olive oil. Place cut side down on the pre-heated grill. Cook for 3 minutes on each side or until marked and warm. Remove from grill and cut off the rind. Discard rind. 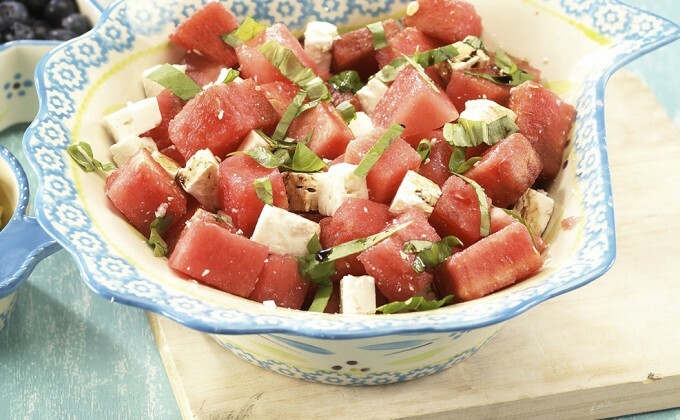 Cut grilled watermelon into 1-inch cubes and place in your temp-tations® 1.5 quart bowl. Slice basil into very thin strips and add to bowl along with salt, pepper and feta cheese cubes. Gently toss to combine. Squeeze lime juice all over the top. For the dressing, place the balsamic vinegar and honey in a small sauce pan over medium-high heat. Bring to a boil and then reduce heat to medium-low. Simmer for 6 - 8 minutes or until reduced to about 3 tablespoons. Drizzle on top of salad. Serve immediately.